It's ridiculous isn't it!!!!!! I mean how many towels do two people need? After a few minutes intense interrogation it transpires that actually they only use one towel each and they have no idea where all the other towels in the wash basket come from!!$£**%!!!! This is the 'before' picture, but alas there is no 'after' photograph because my nestbuilding phase wore off before I finished, now I need the 'Never leave a job half done'-Fairy to visit! You are both making me laugh. It's great to have confirmation that we are not the only ones! 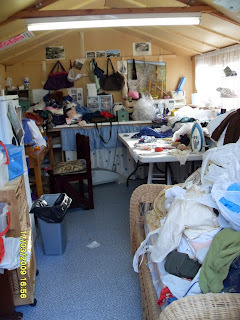 I have to spread everything over the kitchen table when I create,and the more creative I am, the messier it is- like now! I understand completely. Congratulations on your daughter's scholarship!! Thank you Pam very kind of you to say so... and yes... creativity seems to go hand in hand with chaos!